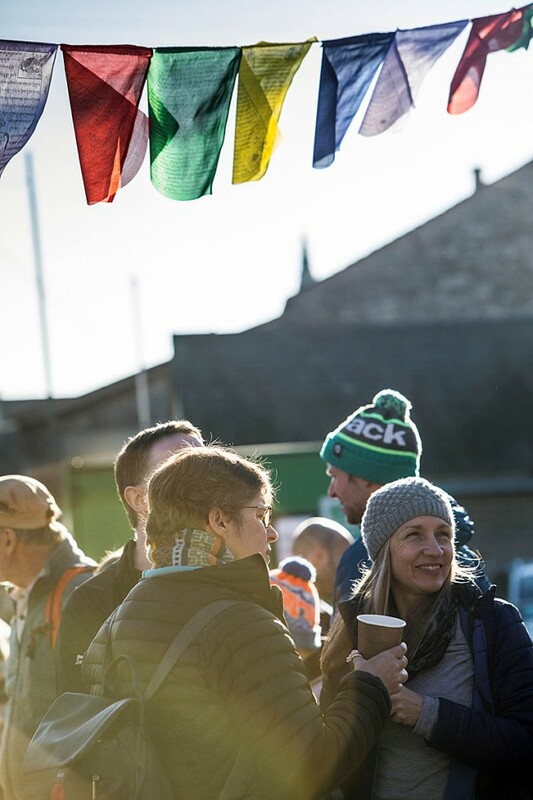 Actually, insulated jackets were the clothing of choice at Kendal Mountain Festival this year as high pressure kept the traditional Lakeland weather fronts at bay and the town gloried in cool clear conditions. It’s hard to eschew the fells when there’s a glorious temperature inversion to be enjoyed, but many did, gathering in the curious wooden ruin-bar style decor of the Basecamp Village in the grounds of the Brewery Arts Centre. It’s a great place to mingle with the crowds, some of whom are big names in the outdoors world – and it’s free. Here, you can rub shoulders with Everest summiteers, top athletes, television names, climbing luminaries and the great and good of the outdoors. 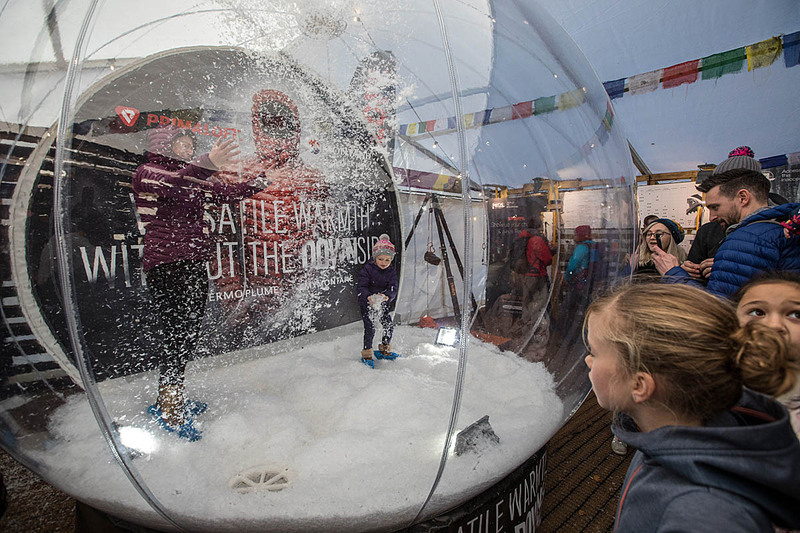 Each year the festival seems to expand a little more, with the Shackleton Tent supplementing the main large marquee, plus a yurt run by pack brand Lowe Alpine. Presentations and film shows are held across the town and, for those who prefer participation, there are opportunities to get more active, though I gave a swerve to the silent disco – with echoes (at least in your headphones) of the excruciating W1A episode. You could probably spend most of your festival sitting in and wandering round the Basecamp. The range of speakers entertaining, free of charge, the gathering from the Marmot Stage varied from top climbers Dave MacLeod and Steve McClure to experts on skyrunning, mountain biking, outdoors technology, paddling and even the launch of the alternative currency the Lakeland pound. 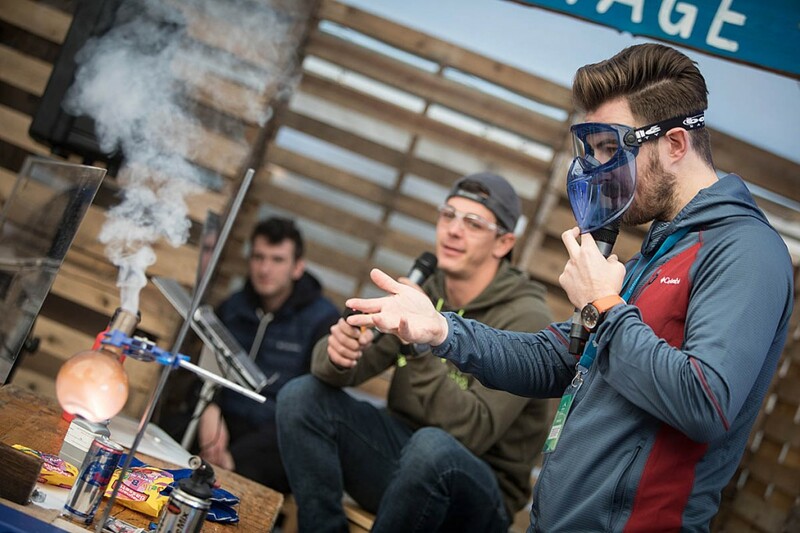 Next door on the Columbia stage, Huw James was explaining the calorific science of adventure with the aid of a jelly baby and a blow torch. National park volunteers were receiving the recognition they deserve while visitors could learn the intricacies of winter walking, drystone walling, open water swimming and continuous munro rounds. Andy Cave was pulling in festival-goers On the Edge of Possibility in the Lowe Alpine yurt, with tales of ascent from the mine shaft to the Himalaya. Visitors also donned outdoor disguises for the Infinitepossibilities photo booth. Back in the Basecamp, winter had come early as children of all ages, some well into their 50s I reckon, stepped into the giant PrimaLoft globe to enjoy a synthetic winter. 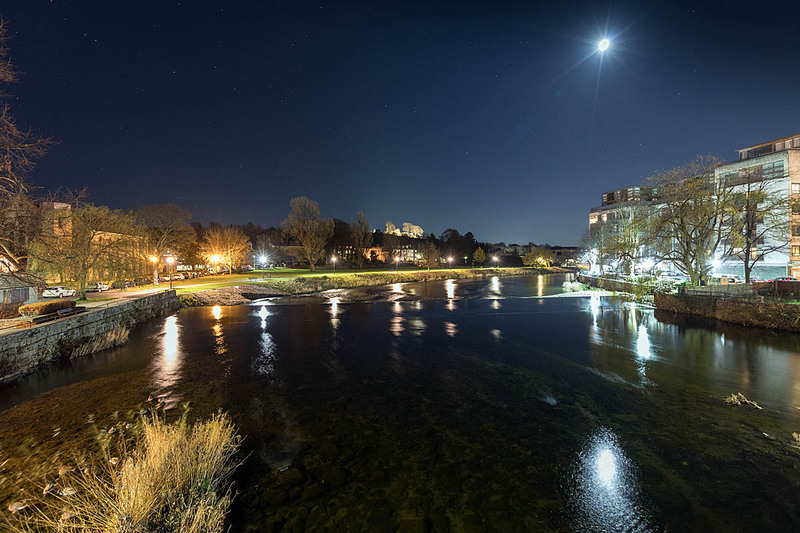 For the thousands of visitors who venture beyond the free entertainment, the Kendal Mountain Festival now boasts more than 150 speakers, the announcement of the winner of the Boardman Tasker Award for Mountain Literature – Limits of the Known by US author David Roberts plus scores of outdoors films. 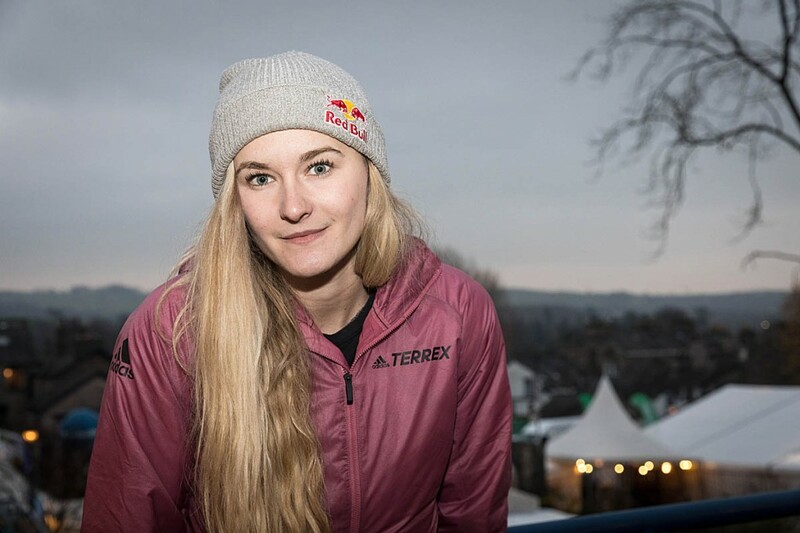 On the Friday I spoke to Olympic hopeful and two-times world bouldering champion Shauna Coxsey whose quest for victory has been on hold in 2018 due to injury and the following day listened to her account of her route to the top of her discipline. We’ll be posting an interview with Shauna soon. The British Mountaineering Council holds a ‘state of the nation’ meeting which this year was less fraught, after the dust has settled on the travails of the past two years and its defeated challenges to the leadership. Vice-president John Roberts likened the council to a ship that has been anchored in harbour while a storm raged. “The organisational review group was tasked with giving it a modern governance structure to try and navigate its way out of harbour,” he said. Lynn Robinson, who was elected the BMC’s first woman president earlier this year, explained the fact that the roles of president and chair of the board had now been split and Gareth Pierce was appointed as chair the previous Thursday. She said the Mend Our Mountains appeal stood at £565,000, almost £120,000 of which had come from a recent crowdfunding campaign. The target was still to raise a million pounds by March next year. The president paid tribute to the BMC’s volunteers and also announced a new recognition scheme. The Rehan Siddiqui Award, named after a former president, would go to someone who had made an exceptional contribution to equality and diversity. There would also be a young volunteers’ award. 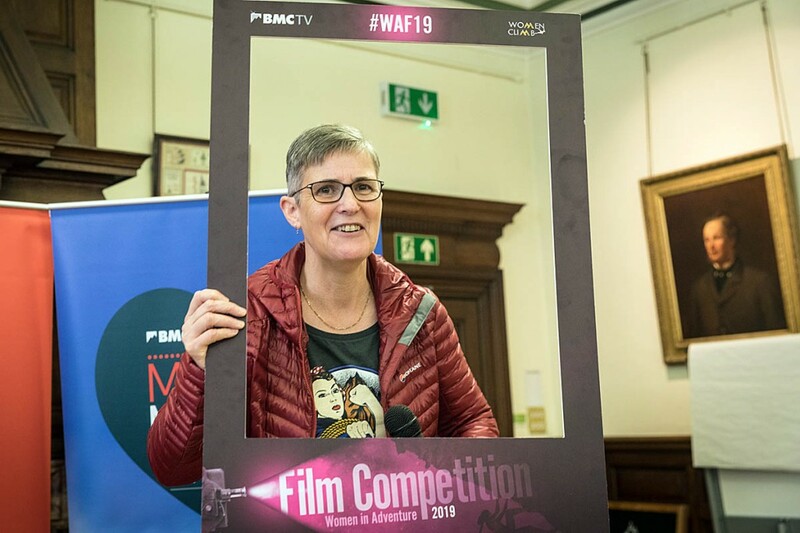 She also encouraged entries for the Women in Adventure film festival and revealed there were ‘all sorts of exciting things’ planned for the BMC’s 75th anniversary next year. 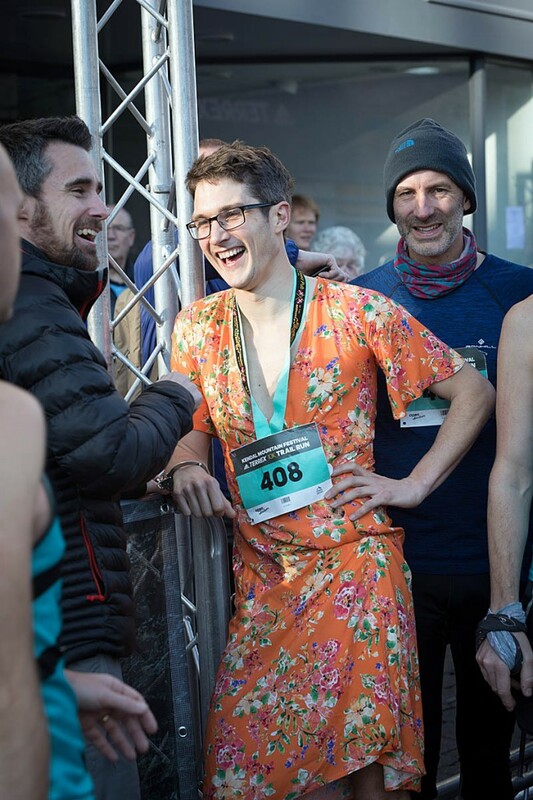 Out on the streets of Kendal, spectators at the Adidas Terrex Trail Run might have wondered why, among the hundreds of suitably attired athletes, accomplished ultrarunner Adam Perry had chosen to run the race in a fetching floral dress. It was, apparently, his way of enjoying his stag do. Jonny Brownlee did the honours with a blast on the air horn and the participants were away, led by a Kendal Mountain Rescue Team Land Rover. Nice to know help wasn’t far away. 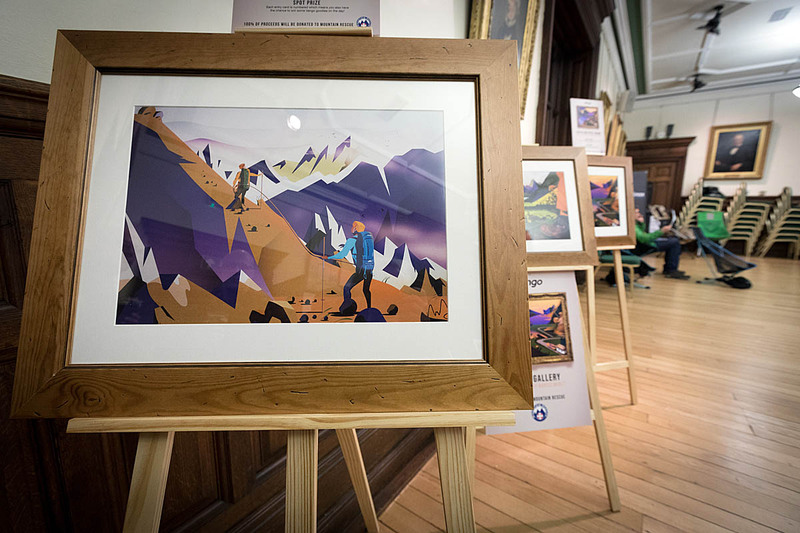 In the Town Hall, another of the venues hosting events, Vango was displaying framed prints of Glasgow artist Marcus Marritt’s work, stylised and retro, which will form the basis of the brand’s marketing. 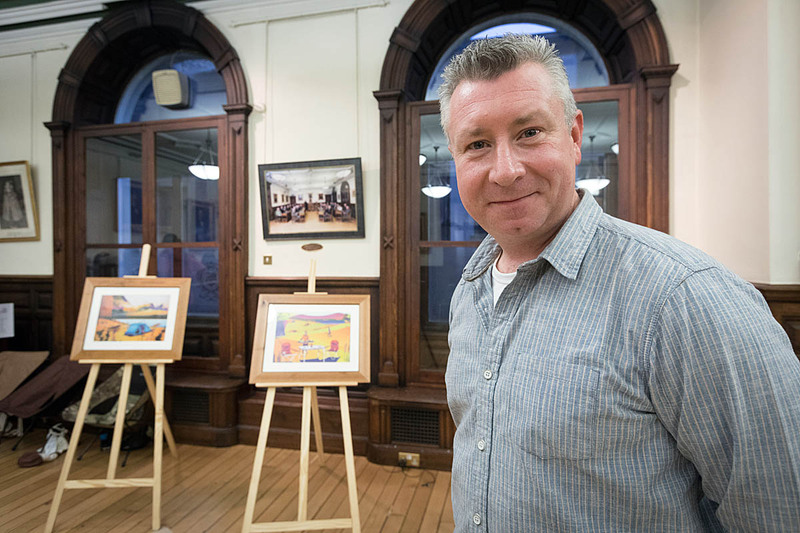 Also on hand with some of his work was film-maker Terry Abraham, who revealed snippets of the content of his film on Helvellyn, the third in his cinematic trilogy examining the lives of Lake District mountains. I’m sworn to secrecy – but the film is unlikely to be complete before 2020. Sunday morning brought a chat with the man formerly known as the Climbing Taxman, Mick Fowler, who tells me of his numerous ascents, including an unusual ice-climb in central London and a hair-raising trip to Peru. But 2018 has been probably the most challenging year of his life – more in our interview that will be published soon. The final port of call was to the town’s leisure centre, half-a-mile or so out of town, to hear the story of the Great Gift of Freedom, the story of the donation of a large chunk of the Lakeland’s fells to the nation as a permanent memorial to members of the Fell & Rock Climbing Club who died in the First World War. The 12 mountains, centred on Great Gable, are now in the care of the National Trust, along with Scafell Pike, which was gifted as another memorial fell by Lord Leconfield, plus Castle Crag in Borrowdale. Sir Chris Bonington, who had been due to host the event, was unable to do so because of illness, but television presenter Paul Rose carried the role solo. 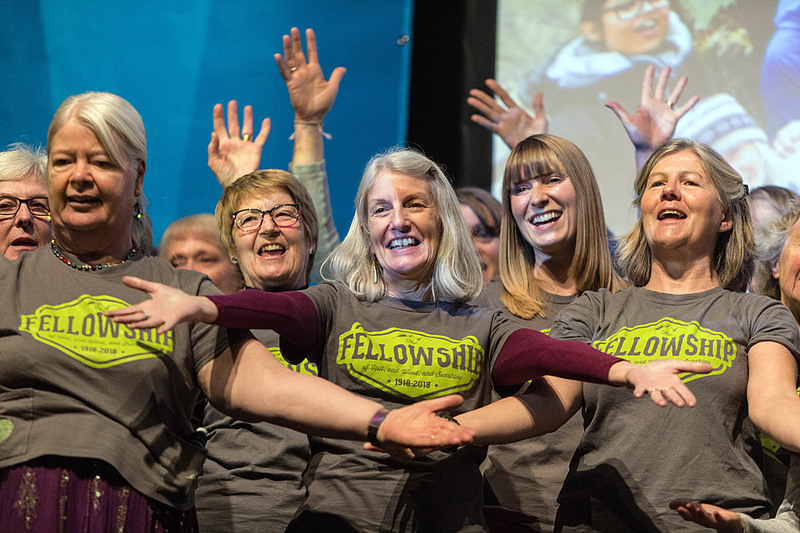 Among those he interviewed was FRCC member Richard Hargreaves, great nephew of mountaineer and poet Geoffrey Winthrop Young, but the most striking memory of the event was the gusto and enthusiasm of the Fellowship of Hill, and Wind, and Sunshine Choir, who opened and closed the event. The choir has performed on nine fells in the past year, marking the centenary of the First World War armistice as celebrations of the Great Gift. I left Kendal with the echoes still ringing in my ears. It’s impossible, I think, to visit anything close to the full programme of the Kendal Mountain Festival, though it is possible to spend lots of your hard earned pounds on some remarkable films, astonishing recollections from top adventurers and, if you really want, a silent disco. But it’s also feasible to just wander round the sites, in the company of like-minded outdoors enthusiasts and play spot the celeb, listen to lots of tales of derring-do without shelling out a penny. Kendal Mountain Festival is what you make it. But one thing seems certain: its place as the premier outdoors festival looks assured.